Multilayer Composite Pipe (MLC) Underfloor Heating Pipe is the perfect choice when installing underfloor heating. The flexibility of MLC pipe results in easy roll outs whilst at the same time giving you a stay-in-place rigid feature. This tube is made of three main layers, plastic then aluminium and plastic. This multi-layered construction makes the tube not only strong (can take 10 bar pressure at 95°C) but also flexible and the aluminium layer makes it 100% oxygen tight resulting in no rusting or failure of the heating system. 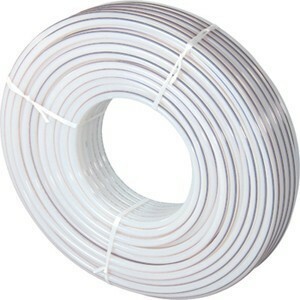 The warmUs 16x2mm Underfloor Heating Pipe is 16mm outside diameter and has a 2mm wall thickness. Suitable for all floor constructions and plumbing applications. The pipe does not have to be pressurised during the laying of the floor although this is good practice to allow any on-site damage to be located. Our pipe is WRAS approved unlike most other MLC pipes on the market so you can use any off cuts for plumbing.